Hey, there! I’m Gavril, the guy behind Mindful Spot. In this post I’m going to talk about why I’ve started a mindfulness blog. In early 2014 my back problems lead me to yoga, but it ended up helping me in a much better way. A deep calming effect experienced during Shavasana sparked my interest in meditation. It wasn’t long before I started my daily meditation practice and it pretty much snowballed from there. By applying mindfulness in everyday life and observing my thoughts, I was able to see the root of my unhappiness and dissatisfaction with life; specifically, that it was created by negative thought loops playing in my head day in and day out. I’ve been exploring what it means to live a more mindful, meaningful life ever since, and I hope you will join me on this journey. 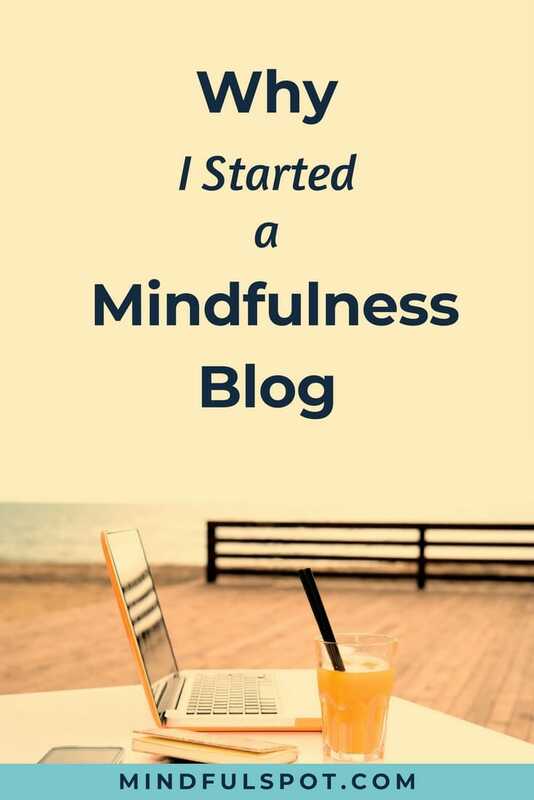 Why Start a Mindfulness Blog? A few years ago, if someone said that I would start a mindfulness blog, I would have said they’re either crazy or don’t know me that well. But here we are. I believe that no matter how complicated or stressful your life is, there is always a possibility of finding peace and clarity right here and now. The best way to cut through a challenging life situation is to learn mindfulness and start a daily meditation practice. It will give you the ability to see your thoughts and their tendency to complicate things in your mind. This blog gives me the opportunity to reach a lot of people around the world. I want to share my experience and knowledge to help them get started with mindfulness and meditation. Many people could benefit from the information I post on this blog, but I write mainly for those who are very new to mindfulness. They are interested in mindfulness but don’t know where to start. Or they’ve tried meditating but found it difficult to concentrate and stick to a regular schedule. These people feel like they need more guidance and someone who would point them in the right direction. I help these people take their first step towards mindfulness: from understanding how it relates to them to maintaining a meditation routine and bringing more awareness into everyday life. How Can You Get More Involved With This Blog? I want to make this a very interactive mindfulness blog where you not only read but actively participate in the discussion process. For example, I highly encourage you to leave comments on the articles that you found interesting or helpful. Maybe you didn’t understand the point I was trying make. If so, leave a comment with a question, and I will answer it as soon as possible. It might also happen that you disagree with something I write. That is also fine! I welcome any and all constructive criticism and open for all opinions and viewpoints. Let’s get to the bottom of the matter together. What Are My Blogging Goals So Far? My first and primary goal is to write a bunch of useful articles for my readers. Hopefully, I will do this with your help by receiving feedback and suggestions along the way. The second goal is to get to know you, my readers, better. I will say again that I highly encourage you to participate by sharing your experiences, asking questions, and even disagreeing from time to time. My third goal is to create an e-course that would help beginners get started with mindfulness, build their daily meditation practice, and experience life from a new perspective. Before I wrap this up, I invite you to join my email list community and get exclusive content and stories only shared with my subscribers. I’ll also send you this free worksheet so you can start meditating today. Hi, my name is Frank and I’m new to mindfulness. My wife suggested I look into this because of my stress and anxiety of late. If you have any questions about the technique or mindfulness in general just reply to this email.